Left: Dirk Hoffmann and Alistair Pike sample calcite from a calcite crust on top of the red scalariform sign in La Pasiega.Right: Drawing of Panel 78 in La Pasiega by Breuil et al.(1913). The red scalariform (ladder) symbol has a minimum age of 64,000 years but it is unclear if the animals and other symbols were painted later. The scalariform (ladder shape) painting composed of red horizontal and vertical lines (center left) dates to older than 64,000 years and was made by Neanderthals. Perforated shells found in sediments in Cueva de los Aviones and date to between 115,000 and 120,000 years. Except, it turns out that some of that cave art may have been created by Neanderthals — our ancient and, by evolutionary standards, failed cousins. At least, that's what a team of scientists is now claiming. Most of this work has long been known and attributed to humans, who originally came from Africa and are believed to have arrived in Spain about 45,000 years ago. But here's the catch. New tests on the rock and calcium carbonate that formed over parts of the ochre show that they were painted 65,000 years ago. That's about 20,000 years before the first modern humans got there. "The only species that were around at that time were Neanderthals," explains Alistair Pike, an archaeologist from the University of Southampton in England who was part of the team that did the work. "So, therefore, the paintings must've been made by them." Pike says the original technique to determine the age of the paintings was used decades ago and wasn't very reliable. It measured how much carbon was in the rock, which is prone to error. So these scientists employed a different dating technique using radioisotopes of uranium and thorium. That technique showed the paintings were much older than first thought. That turned the conventional wisdom, that only modern humans made art, on its head. "We're over the moon," says Pike. "This has taken us 10 years to get to this point." Neanderthals are thought to have evolved in Asia and Europe from a common ancestor of humans and Neanderthals. Their bones were first discovered in Europe in the 19th century and they were as close to us physically as any known human relative, but Neanderthals were thought to have been brutish and stupid subspecies of modern humans. Recent genetic evidence indicates that they did breed with modern humans who came over from Africa. But, art? That requires abstract, symbolic thinking — recreating something real, like a pattern or a landscape, with symbols. 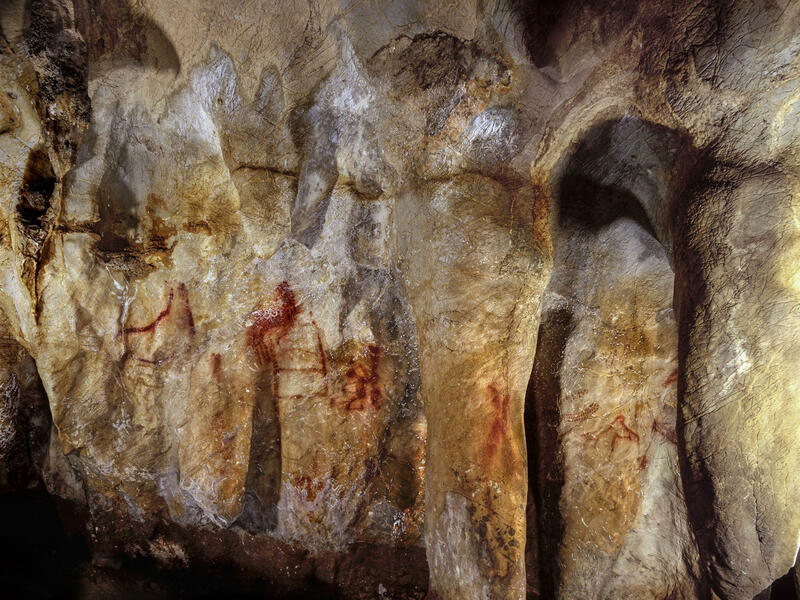 "We have examples of pigment use and cave paintings way outside of Europe [in Africa], and we have them in Europe, clearly demonstrated to be of Neanderthal origin," says Dirk Hoffmann, a physicist with the Max Planck Institute for Evolutionary Anthropology and an expert on the dating on the paintings in Spain. He says this new analysis shows that art evolved independently in both places. Hoffmann suggests that making these paintings may well have required planning, organization, perhaps even language, though he acknowledges that's speculation. And clearly, some of the paintings required hearty determination. "They're actually hidden away," he says. "If you want to see them you walk into the deepest, darkest part of the cave and you actually have to lie down and crawl to the cave wall and look up, and they're actually on the ceiling in little overhangs." In a fourth cave, the scientists also found another pile of evidence pointing to Neanderthals: painted shells, some with a single hole drilled through them, perhaps to accommodate a string. The shells lay in a seaside cave and date back about 115,000 years — far earlier than the first known sign of modern humans in Spain. "I think we should accept them as part of us. They are part of our lineage, they are human, they're just a different human population," says Alistair Pike. The results are published this week in the journals Science and Science Advances. Whether the scientific community will give Neanderthals final credit depends on whether the latest dating technique holds up to scrutiny. These techniques give a range of possible dates, rather than an exact time. And there was certainly overlap between modern humans and Neanderthals in Europe. If new evidence shows that humans actually arrived earlier than scientists now think, well, that's the pattern of science. Tens of thousands of years ago, artists painted images on cave walls. It had been thought those artists were humans. NPR's Christopher Joyce reports on new evidence that our ancient cousins, the Neanderthals, were the artists behind some of the works. CHRISTOPHER JOYCE, BYLINE: The paint they used was red ochre from soil mixed with water. The canvases were the walls of three caves in different parts of Spain. They drew a bold, geometric design that looked like part of a ladder. They pressed a hand up against the wall and made a stencil of it by blowing ochre over it. They painted red dots. And apparently they were not modern humans, Homo sapiens. 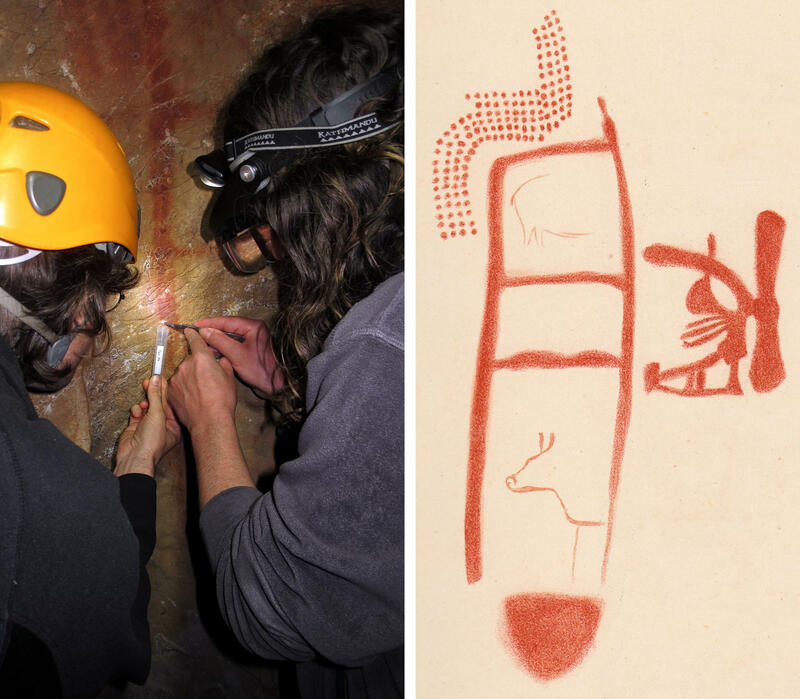 As archaeologist Alistair Pike explains, the artists did this 65,000 years ago. That's about 20,000 years before the first modern humans are thought to have arrived in Spain. ALISTAIR PIKE: The only species that were around at that time were Neanderthals, and therefore the paintings must have been made by them. JOYCE: Neanderthal bones were first discovered in Europe in the 19th century. Neanderthals were humanish but were thought to have been brutish and stupid, not budding artists. People knew about some of these paintings before and figured they were done by modern humans. But the technique used to determine their age was sketchy. So these scientists used a different dating technique, and it overturns conventional wisdom. PIKE: We're over the moon. This has taken us 10 years to get to this point. JOYCE: This is part of an ongoing rehabilitation of Neanderthal lore. For example, recent genetic evidence indicates that they did breed with modern humans who came over from Africa. But art was something humans did as far back as 80,000 years ago in Africa. Physicist Dirk Hoffmann of the Max Planck Institute for Evolutionary Anthropology was among the dating experts on the team. He says this new analysis shows that art evolved independently in both places. DIRK HOFFMANN: You find exactly the same thing in Spain. The Neanderthals must also have had symbolic behavior. JOYCE: Hoffmann suggests that making these paintings may well have required planning, organization, perhaps even language. And some of them as, Alastair Pike notes, required hardy determination. PIKE: They're actually hidden away. So if you want to see them, you walk into the deepest, darkest part of the cave. And you actually have to lie down and then crawl to the cave wall and look up. And they're actually on the ceiling on little overhangs. JOYCE: The group also found another pile of evidence pointing to Neanderthals - painted shells, some with a hole drilled through them, perhaps to accommodate a string. The shells lay in a seaside cave and date back about 115,000 years, far earlier than the arrival of modern humans in Spain. The results are published in the journals Science and Science Advances. This may not be the last word on the provenance of this artwork. The dating techniques offer a wide range, not the exact times, and will no doubt undergo a lot more scientific scrutiny. Christopher Joyce, NPR News. Transcript provided by NPR, Copyright NPR.